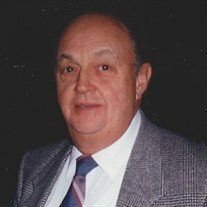 Dean "Chief" L. Hastings, age 87, passed away peacefully on January 26, 2019 at Avon Oaks Nursing Home in Avon, Ohio. He was born March 14, 1931 in Batesville, Ohio to Roy and Eleanor (nee Cline) Hastings. He graduated from Batesville High School in 1949 and enlisted in the Army the same year. He served as Staff Sergeant for the 142nd Armored Signal Company of the 2nd Armored Division and was stationed in Germany during the Korean Conflict. After his separation from the Army, Dean went on to work at U.S Steel from 1952 until his retirement in 1989. Dean was a lifetime member of the Amherst American Legion Post 118, Italian-American Club Post 1 and VFW. He enjoyed fishing, dancing, tinkering and was a very skilled gardener. Above all, Dean was known for being a loving father and great friend to everyone. Surviving is his wife of 64 years, Lillian (nee Gentile) Hastings; daughters, Paula Jo (Tom) Kish Jr. and Darlene (Scott) Orosz; son, Todd Hastings; brothers, Hugh Hastings and Lonnie Hastings; grandchildren, Deana, Hallie, Kerri, Lisa and Todd Logan, as well as five great grandchildren. He was preceded in death by his parents and brothers, Donald Hastings and Robert Hastings. The family will receive friends on Monday, February 4, from 4-8 p.m. in the Dovin Funeral and Cremation Specialists, 2701 Elyria Avenue, Lorain. Graveside services with Military Honors will be held on Tuesday, February 5, at 11:00 a.m. at Resthaven Memory Gardens, 3700 Center Rd, Avon.